In DesktopSnowOK is quite easy to convert to 2000 snow flakes that fills the full and ultra HD screen well! You can adjust the snowflakes individually in the number and size, i can not set up a rule here, depending on the User needs you can set the digital snowflakes like the snow cannons in the Alps freely. Nevertheless, these digital snowflakes are far more environmentally friendly than the artificial ones in the Alps. 1.) ... The effective digital snow cannons for Windows! 2.) ... It's very hard to control the exact amount of snowflakes! 1.) The effective digital snow cannons for Windows! Previously, DesktopSnowOK was limited to 64 flakes, after multiple user request, I have completely reworked the source code (Ver 3.61) and improved the snowfall algorithm and the rendering engine can now be set up to 2000 snowflakes and the CPU load through the snow remains in the acceptable range. Simply put what you like, at best with this more effective digital snow cannon, it really does not matter if it's on the new MS Windows OS, or on one of the older operating systems. See also: ► The leaves are not in the foreground, they only fall on the desktop? Digital snow cannons the CPU is gentle! 2.) It's very hard to control the exact amount of snowflakes! (Image-2) adjust the snowflakes count exactly! It's very hard to control the exact amount of snowflakes, due to the large range of the slider. Perhaps there should be a checkbox to enable larger numbers. (For example, it would normally be 5-200, then you could click a box and have it be the way it currently is.) No matter how it's done, I would just like more control over the exact number. Perhaps even a box to type in the number. 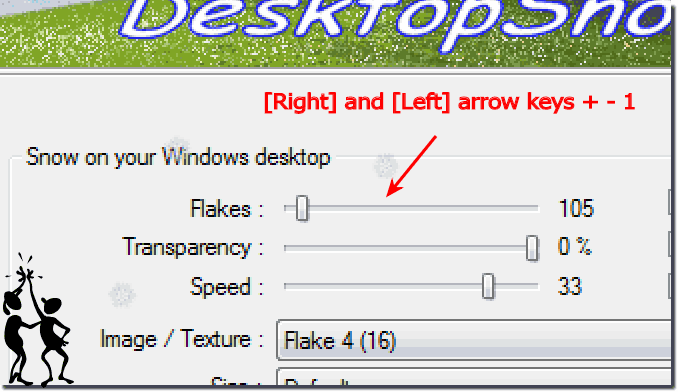 DesktopSnowOK - FAQ-6: How many snowflakes should I use with Ultra HD monitors? For what Different Performances in the Desktop Snow?